At almost fifteen issues and 300 pages, I credit New 52: Futures End Vol. 2 for being a hefty collection. I also count over thirty characters involved in various storylines, making the story a kind of futuristic Mad, Mad, Mad, Mad World here at the end of DC Comics's New 52-branded era. With all this variety, there are some storylines that clearly work and others that plainly falter. I came away from this book entertained, but also with a distinct sense of this as the middle act of a story that serves mainly to put the pieces in place for payoffs reserved for the last volume. Futures End Vol. 1 ended with Brother Eye mind-controlling captured Earth 2 superheroes and setting them on a rampage through the Cadmus prison island where they were being studied (some five years removed from the DC Comics "present"). This second volume takes place, if not always at Cadmus, then against the backdrop of the ongoing prison break. This gives the volume a certain "real time" feeling that reminds of DC's quintessential weekly series, 52, and any amount to which a weekly series can evoke 52 is a good thing. Futures End more often emphasizes action over characterization -- a product of having far too many characters -- and in that way pales to 52 in the final tally, but at least there's a good sense of the weekly series being used as more than just a longer-form miniseries. The Cadmus site is the focus of some of the best and worst of Vol. 2. 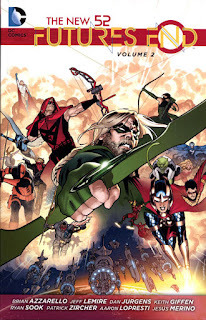 On one hand, it brings together the Earth 2 heroes (the most interesting part of this and a good advertisement for the companion weekly series Earth 2: World's End) with Green Arrow and his band of characters, and Lois Lane and Grifter, among others. It's the expected trajectory of a story like this to start to merge the storylines together, but there's still a thrill for instance in seeing Green Arrow teamed with the Earth 2 Red Arrow or watching "our" Lois Lane meet her Earth 2 Red Tornado counterpart. On the other hand, there's still a considerable amount of pages given over to Cadmus's childish, super-powered creation "Fifty Sue," and her ongoing partnership/conflict with Deathstroke and King Faraday. This ties in, often confusingly, with some scheme by Frank "Sergeant" Rock and his team of assassins lead by Wildstorm's Voodoo to kill, but later team-up with, Fifty Sue. The girl's Looney Tunes antics fail to amuse; in her not-quite-funniness, I sense writer Keith Giffen and the kind of gags that maybe work with familiar characters but fall short because the audience isn't invested in any way in Sue. Scenes involving whether equally one-note new characters Banger and Mash will kill Sue or whether Deathstroke has hurt Sue's feelings and so on fall flat because it's a bunch of characters that don't matter beyond this story talking about other characters that don't matter beyond this story. That can't excite set next to stories involving Green Arrow, Firestorm, Earth 2, Batman Beyond, and so on. Indeed one of Futures End's increasingly apparent drawbacks is the fact that all of this takes place in a five-years-hence continuity that's most surely to be erased by the end of this book (even the lone spin-off does not take place in this timeframe and seems to involve a minority of these characters). Another engaging storyline, removed for the moment from Cadmus, is the struggle of Firestorms Ronnie Raymond and Jason Rusch, and Jason's eventual combination with Madison Payne to become a new female Firestorm -- but it's hard to get really excited about this when it's essentially an Elseworld with no bearing on the present. Equally Batman Beyond's attraction to the robotic Plastique is surprisingly sweet, but I sense that too won't be important for long. I grant some of the thrill of Futures End may be dulled by my foreknowledge of Convergence, but I was left scratching my head when this volume gets to a seemingly climactic point of connected covers and Brainiac announcing the "Blood Moon." I went back and looked at DC Comics's "Blood Moon" teaser and I don't see anything overly surprising in it; one of the Futures End covers included here shows various Supermen battling various Brainiacs, but again, it's nothing that manifests so overtly in the book. Futures End will get there, I trust (or at least Earth 2: Worlds End will), but Convergence is not manifest in this volume as much as the imagery would lead one to believe. If the legacy of New 52: Futures End Vol. 2 is a fleeting glimpse of a future Stormwatch with Black Adam, Frankenstein, and Amethyst as members, I'll take it. In all, however, this volume of Futures End mainly reminds me just to go catch up my Earth 2 reading, the characters of which again remain the most gripping part of this volume. Special credit to Cully Hamner for art on a harrowing flashback issue where the Earth 2 characters lead an exodus from their world to Earth 1, but it underscores that the best part of this title might be in a different book. The only thing that left of Futures End is the new series Batman Beyond. That's not so much. Anyway, the journey was quite interesting. Maybe that's the important part. Glad if you enjoyed this book (and I did, too), but in my review of Futures End Vol. 3 I'll argue the opposite point, that the journey for many of these characters without any subsequent destination disappointed me in the end. And I completly understand that.